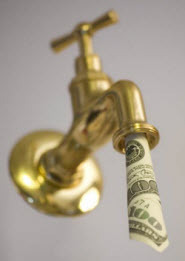 Cash Flow vs. Cash Crunch: ?My Tax Return Says I Made A Profit, But My Checkbook Says It Lies? Ronnie owns and operates a media sales business. He is the only employee. He works hard and is told he is successful. I put it that way because Ronnie isn?t sure. We met for an initial visit and, after a pleasantry or two, he told me this, ?My tax return says I made a profit, but my checkbook says it lies.? I?d never heard it put quite that way, but I immediately knew what he meant. Ronnie has lots of company. He puts sales on the books, pays his business bills, doesn?t have a lot of cash left, and is stunned when he learns he made a decent profit and owes more income tax than expected. Ronnie?s question to me, ?Where did it go?? After paying business expenses, there are only two places money can go ? first, investment in the business, and second, a return to the investor/owner. Let?s look at where Ronnie found his money as I suspect his situation isn?t much different from yours. Let?s dispense with the second possibility first ? return to the owner. Ronnie is a sole proprietor who files a Schedule C as part of his federal income tax return. Sole proprietors don?t receive a paycheck. Instead, they receive draws from the business. Ronnie keeps good books and properly records every check paid to him. He knew how much money he received from the business. No surprise there. What Ronnie didn?t realize was how much he was investing and reinvesting in his business. We began by looking at an investment that most entrepreneurs fail to recognize ? their investment in Accounts Receivable (AR). Ronnie is no different. He bills his clients monthly and collects most accounts within the following month. Ronnie is a victim of his own success. As his business grows, his monthly billings and, therefore, his monthly AR are also growing. Ronnie ran up against a cardinal rule of business ? money almost always goes out before it comes in. Stated another way, Expenses must be paid on time (usually monthly) while revenue (sales/receipts) come in more slowly. Ronnie keeps his books just like most entrepreneurs. He has loans, as do most entrepreneurs, and makes monthly payments. He records the payments as an expense. However, only the interest is a deductible expense. The principle portion of his payment is an investment in his business ? the repayment of a loan that allowed him to buy equipment before he had the spare cash to pay for it. Ronnie also learned that the purchase of that equipment is deducted over time through the mechanism called depreciation. You guessed it. The equipment is an investment in his business that IRS says must be deducted over the expected lifetime of the equipment. Ronnie learned there are many different ways to invest and reinvest in his business. Although he doesn?t like the conflicting messages between his checkbook and his tax return, he now understands where his money is going. Fortunately, there are methods to reduce the gap between money going out and money coming in. These methods are called cash flow management and will be the subject of future blog posts. For now, remember there are only two places your money can go: 1) investments in your business, and 2) paying yourself. The next time you consider buying something for your business, make sure you also think about how more money can go into your own pocket.